Luxury and decadence are the first lifestyle associations in America (mostly New York) which also marked the twentieth years of the past century. Glamorous parties, luxury homes and vacations of rich, expensive cars and drastically changed and ‘freed’ women’s fashion and styles were characterized by the so-called jazz era. We could imagine ourselves living in that era or having that lifestyle. And while we are impatiently waiting for a new Great Gatsby film that realistically describes society in the mentioned epoch, we need to go to the cinema and restore our memories or take a book, an American classic with the same name as the movie, but also inspired by the feminine fashion of the twenties. We can get ourselves into it and try to live in that era even for a few hours. In this fashionable task, you need a design from a collection inspired by the Great Gatsby fashion or you can use the appropriate pieces of clothes and get yourself ready for a Great Gatsby themed party. Clothes that fit in with femininity and elegance from that period are something every girl wants in her wardrobe. 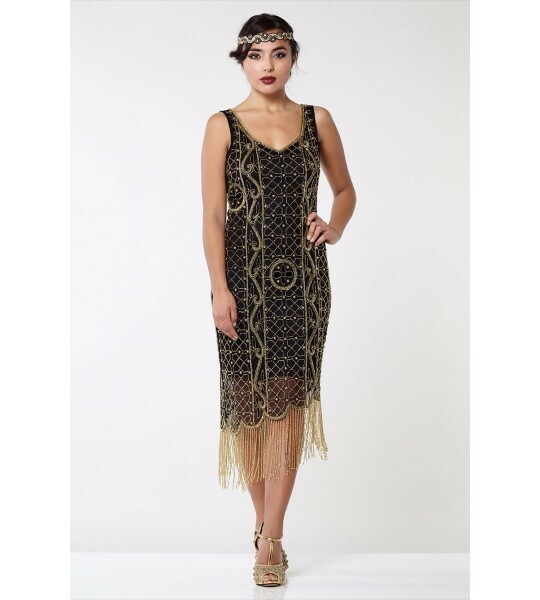 In order to get dress yourself in the style of the Great Gatsby, you can use a peplum cocktail vintage dresses which is something that has been available on the market for several seasons, and some of them are even decorated with lace. For a distinctly feminine outfit, combine a peplum blouse with a pencil skirt to the knee, and if you prefer a slightly edgy style, it is best to wear black leather pants. Peplum is very modern, for several seasons now. Since the 20ies were the years of skirts and dresses and are gone, it does not have to mean that you are not allowed to get back to that style every now and then. You can go along with this trend by wearing short dresses or interesting asymmetric skirts. If you combine them with wonderful, short blazers, you cannot make a mistake, such combinations are always modern and classic if combined with the right accessories. For that purpose, use a blazer that’s always in fashion. In order to give your Great Gatsby themed party outfits a glamour dose, it’s best to enrich these simple dresses and combinations with captivating accessories. An elegant necklace or a bracelet can certainly help you with that.